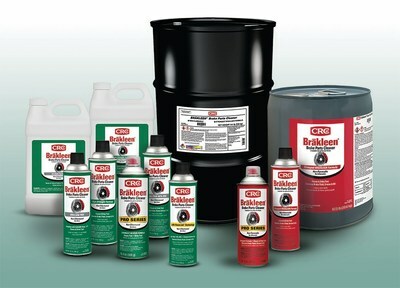 HORSHAM, Pa., March 28, 2019 /PRNewswire/ -- CRC BRAKLEEN, the number one selling brand and original aerosol brake parts cleaner, is available in both chlorinated and non-chlorinated formulas to comply with state regulations and meet the needs of professional shops and DIY consumers in all 50 states. Managing individual state regulations for maintenance chemicals can be complex for distributors, wholesalers, retailers and end-user consumers. CRC continually monitors regulatory trends and the potential impact, aiming to simplify decision making for its customers and ensure their compliance. As a result, CRC has also revamped the BRAKLEEN line's packaging to make it easier to identify which formulas to choose. "We know our customers immediately recognize the red can of CRC BRAKLEEN," said Louis Fresta, vice president of sales and marketing for CRC. "Red has identified our original brake cleaner since 1971, and it's still our strongest formula. Red is iconic for BRAKLEEN and that won't change. But state regulations have changed and will continue to change. So, we've simplified our packaging to make product selection as easy as possible: BRAKLEEN in red packaging is chlorinated, while BRAKLEEN in green packaging is non-chlorinated." While the original, best-selling CRC BRAKLEEN formula may be used in all states excluding California and New Jersey, some facilities restrict the use of chlorinated solvents. Non-chlorinated brake cleaners contain VOCs to replace some of the cleaning power lost when switching to non-chlorinated formulas. However, individual states have set varying limits on the use of VOCs. Consequently, CRC offers BRAKLEEN in eight formulas including regular and PRO SERIES versions of Non-Chlorinated – High VOC, Non-Chlorinated – Low VOC, Non-Chlorinated – Less than 10% VOC, and Non-Chlorinated – Ultra Low VOC formulas. This wide array of choices allows consumers and professionals to access the strongest possible brake parts cleaner while remaining compliant with local regulations.